This past Sunday I went up to Sarnia to try a lakewatch. Winds were not ideal (again! ), but that has been the trend lately. Things are not like they used to be as weather patterns have changed. A few years ago (2013), I wrote an article for OFO News about the traditional spot, copied below. Deryl Nethercott joined me for a while on Sunday. While there, we had a Golden Eagle in our sights, which ended up at Canatara Park. On the way home, I stopped at several spots to look for birds. It was a dull day (as usual for a weekend), so any photos I took were not good. 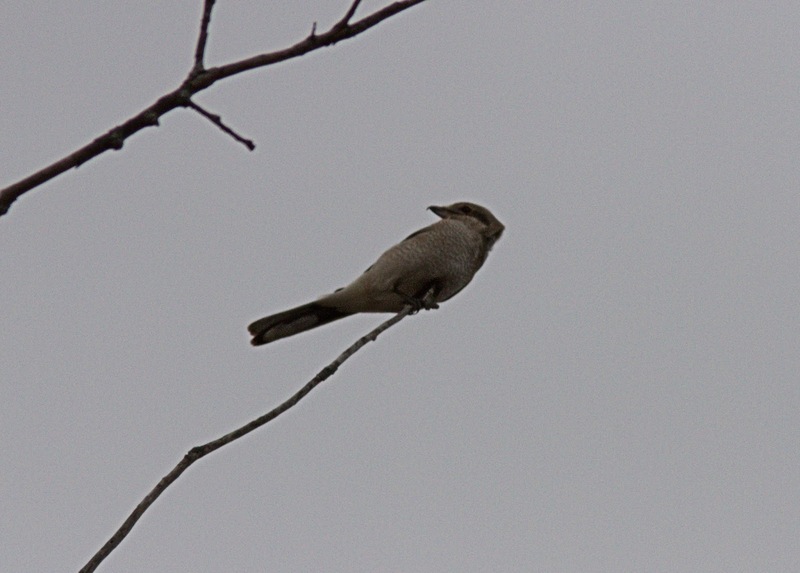 I came across a couple of Northern Shrikes. 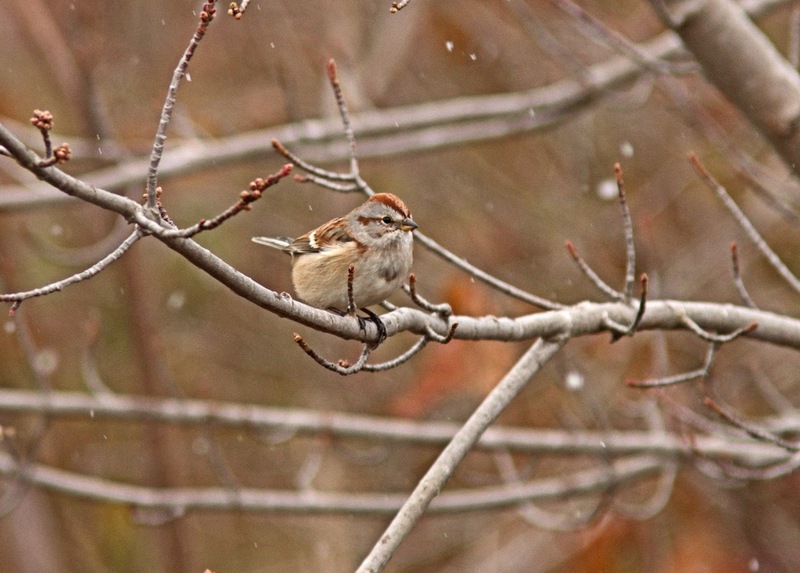 Some other birds included American Tree Sparrows. One of the best places to view pelagic species in southwestern Ontario is at the mouth of Lake Huron where it feeds into the St. Clair River, north of the city of Sarnia. Located at the north end of Fort Street from Point Edward, it has been known by many names such as Sarnia Waterworks, Point Edward Lighthouse, or Point Edward Lakewatch. It is a misnomer since there is no lighthouse there, just a range light for incoming ships. As well, the parking lot (just north of the Sarnia water intake plant) is actually within the Sarnia city limits along a strip that extends inland for a couple of hundred metres to border the village of Point Edward. Whatever you call it, birders flock there in the autumn on strong northerly winds in hopes of seeing jaegers, uncommon to rare gulls and waterfowl. Best winds are straight from the north, or NNW and sometimes NNE. The stronger the better! Birders can sit in their cars since the parking lot faces almost directly north onto Lake Huron. Often it is too unbearably cold and windy to stand outside for any length of time. Scopes can be set up on the lawn in less harsh conditions. Michigan birders often come here for better viewing as their lookout spot at Lighthouse Park in Port Huron does not provide as good of a view. The fall birding season extends from late August through the end of December, but peak times are late October into November when Black-legged Kittiwakes, Sabine’s Gulls and jaegers are on the move in good numbers. Many years ago some local birders at Sarnia decided to see if there was an advantage in going out into the lake on a boat during a suitable wind. It was found that birders who stayed onshore saw much more than those on the boat! Obviously one’s position in a boat leads to a more restricted view. This birding hotspot was well-covered in the past, as the late Dennis F. Rupert faithfully monitored birds here. It was a tradition in the fall to see Dennis parked at the end of the lot during suitable weather conditions. He took every opportunity available to pursue one of his favourite past-times. As a result, he produced quite a database of bird passages at this vestige point that remains unmatched to this day. In the February 1995 OFO News (vol. 13, no. 1) Dennis wrote a short article entitled Sarnia Waterworks in which he listed some his data. Analysing this information, one may come to the conclusion that things have changed in recent times as in some cases the numbers of today fall quite short. Perhaps it is the change in weather patterns, and/or fewer birders at the location that may explain the recent shortfall. However, all three jaegers, Black-legged Kittiwakes and Sabine’s Gulls are still recorded almost annually. An average of two Sabine’s are seen each year, which correspond to the findings that Dennis listed. Many rare birds have been documented here such as Common Eider, Pacific Loon, Northern Gannet, Magnificent Frigatebird, Gyrfalcon and Mew Gull. More recently an Ancient Murrelet (7November2004) was seen on a strong north-westerly wind. Less common birds often observed include King Eider, Harlequin Duck, Purple Sandpiper, Red Phalarope, Laughing Gull, Franklin’s Gull, Little Gull and Eared Grebe. It is not uncommon in the fall to see a Short-eared Owl coming in straight off the lake from the north! In recent years, it is my observation that there are two to three really good days per autumn at the lakewatch. Just last fall on 29-30 October, with probably the strongest north wind ever experienced there, there was a flurry of avian activity. As a result of the strong winds of hurricane Sandy, waterbirds (especially ducks and gulls) concentrated at this funnel to the entrance of the St. Clair River; they were unable to travel any distance. 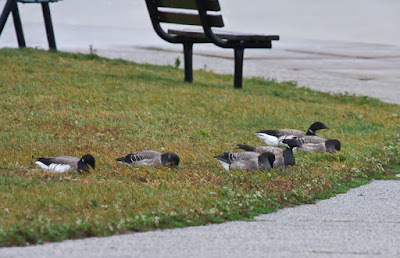 The many birders present were able to witness the largest concentration of Brant geese ever recorded there on 30 October. As many as 250 Brant were essentially grounded there. Not only were hundreds of waterfowl present, but birders at the site had fun picking out various gulls. On those days species recorded included Franklin’s Gull, Thayer’s Gull, Iceland Gull, Lesser Black-backed Gull, Glaucous Gull, “Nelson’s” Gull, Sabine’s Gull (2) and Black-legged Kittiwake (3) not to mention the four common species of gull we normally see. At least two Red Phalarope were also in the mix. 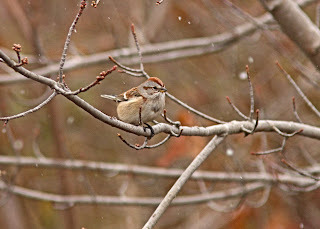 Last fall jaegers were rather scarce, but in contrast, the fall of 2011 was a banner year. The first day of October was best in years with all three jaeger species being seen including a Pomarine, two Long-tailed, and about a dozen other jaegers, most being Parasitic. Black-legged Kittiwake and Sabine’s Gull were noted as well. This fall many birders will again be at the lakewatch on the next strong northerly wind to continue the Dennis Rupert tradition!